Apple to ditch LCD for OLED on all iPhones from 2020 | What Hi-Fi? Could this mean a flexible iPhone? The rise in popularity of OLED looks set to continue with the news that Apple is set to use OLED screens across all its iPhones from 2020. At the moment, the high-end iPhone XS and XS Max phones have OLED screens but the (slightly) more affordable iPhone XR still has an LCD screen. The iPhone 8 and iPhone 7 also sported the Retina HD LCD screen. Now a report in The Wall Street Journal suggests that Apple will move entirely to OLED screens from 2020. It's widely expected that this year's new iPhone, likely to be launched in September, will be an iterative model. This makes it likely that there will still be an LCD phone in the line-up. But from next year, we could see only OLED iPhones. 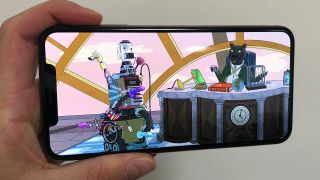 Other phone manufacturers have been using OLED screens in its premium phones for a while, from the LG G7 to the Samsung Galaxy S9, the Sony Xperia XZ3 to the Huawei P20 Pro. The soon-to-be-announced Galaxy S10 will no doubt be OLED, too. OLED screens allow phone manufacturers to be more flexible with the design - literally in some cases, with the first flexible phones seen in the form of the LG G Flex and G Flex 2. Both LG Display and Samsung Display manufacture OLED displays – with both companies now reportedly supplying screens for iPhones – and both have been investing heavily in OLED production in recent years.